Make the most of your energy dollar. Just follow these simple guidelines and enjoy lower gas bills this season. 1. Set your thermostat as low as is comfortable in the winter. For each degree you raise your thermostat setting, your fuel bill climbs 3 percent. Dress accordingly and consider slipping into a sweater before you crank up the temperature. 2. Clean or replace filters on furnaces once a month or as needed. A simple task like this could improve your systems' energy efficiency by 10 percent. 3. Clean warm-air registers, baseboard heaters, and radiators as needed; make sure they're not blocked by furniture, carpeting, or drapes. 4. Bleed trapped air from hot-water radiators once or twice a season; if in doubt about how to perform this task, call a professional. 5. Place heat-resistant radiator reflectors between exterior walls and the radiators. 6. Use kitchen, bath, and other ventilating fans wisely; in just 1 hour, these fans can pull out a houseful of warmed air. Turn fans off as soon as they have done the job and try to keep the humidity level between 30 percent and 60 percent. 7. During the heating season, keep the draperies and shades on your south-facing windows open during the day to allow sunlight to enter your home and closed at night to reduce the chill you may feel from cold windows. During the cooling season, keep the window coverings closed during the day to prevent solar gain. 8. Close an unoccupied room that is isolated from the rest of the house, such as in a corner, and turn down the thermostat or turn off the heating for that room or zone. Some programmable thermostats now come with temperature zoning options However, do not turn the heating off if it adversely affects the rest of your system. For example, if you heat your house with a heat pump, do not close the vents. Closing the vents could harm the heat pump. 9. Consider installing double-pane windows with protective coating that reflects heat back into your home during winter. If such a retrofit is not in your budget, cover your windows with clear plastic film. At a typical cost of $4 to $6 per window, the film creates an insulating air pocket between the plastic and the window, reducing heat loss through windows by between 25 percent and 50 percent. 10. Caulk and weather strip around exterior seams, cracks and openings. Pay extra attention around windows and at points where various exterior materials like wood, brick and vinyl siding meet. And on the inside, caulking and weather-stripping around windows and door frames will cut down on drafts. 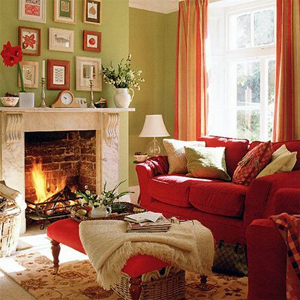 These simple tips can save you a lot of money this winter season and help create a cozy home all winter long.